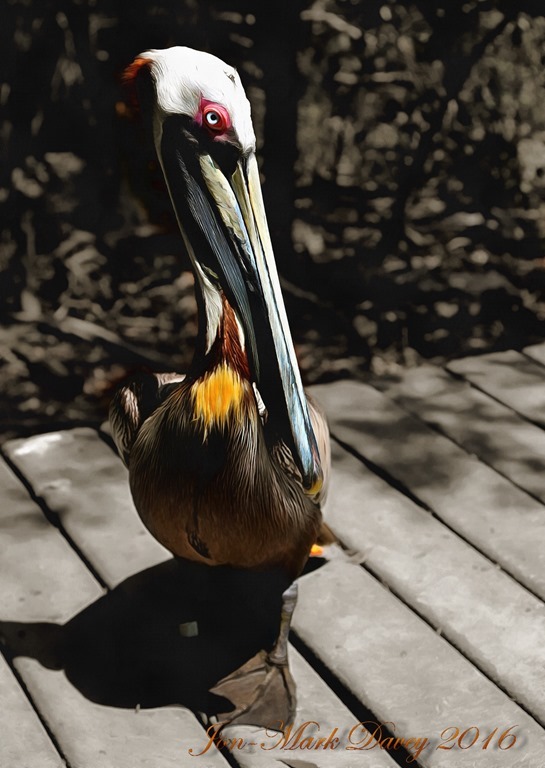 I was at a bird sanctuary in Key Largo recently. The facilities are very rustic and offers a nice boardwalk leading from the parking area out to the water to the west. Along the path are aviaries housing injured or rehabbed birds in large screened areas. As we were walking along the path we came upon one of the feeding buildings and standing there, next to the old-time rocking chair, was the most beautifully crafted wooden Pelican sculptures I’d ever seen. He was the most amazing creature, with dynamic and beautiful textures and colors, the best I’ve ever seen, someone was quite the artist. I bent over to touch and admire the detailed handiwork and the sculpture blinked at me. It was a real Pelican. So beautiful and still as it stood there watching my wife and me walk the boardwalk to the gulf.